Online registration for this event is closed. ON SITE RACE DAY REGISTRATION is Saturday May 19th from 6:30 to 7:45am! Half off for this category. T-Shirt guaranteed if you are registered by May 7th. Half Marathon covers 13 miles of the dynamic and beautiful terrain starting in LeClaire, circling into the outer countryside of Bettendorf and returning full circle to the Black Watch Room located on Pebble Creek Golf course to join in the post race festivities, including live bands all day long and plenty of activities for kids until 1pm!! Stay for fun, food and drinks! RACE DAY REGISTRATION Saturday May 19th from 6:30 to 7:45 AM! Water stations will be located every 2 miles along the half marathon route and porta-potties will be located at miles 4 and 9. You are guaranteed a T-Shirt if registered by May 7th. 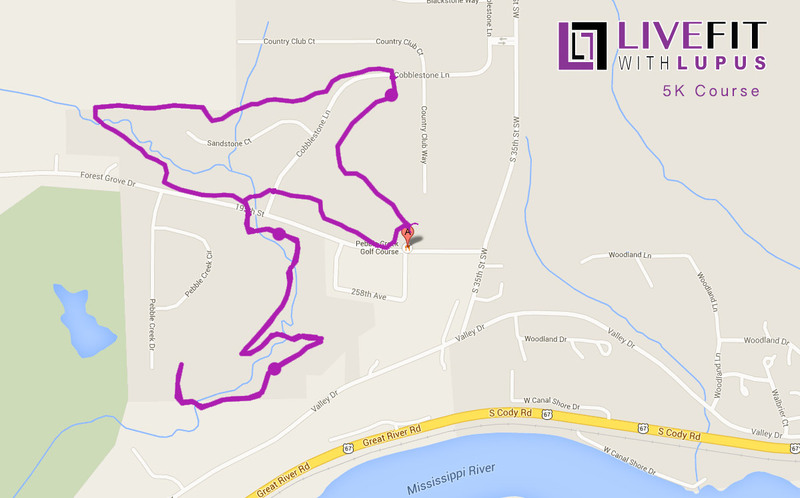 Starting at the Pebble Creek Golf Course, this walk/run route is full of breath taking scenery, with wooded land, rolling hills and views of the scenic Mississippi River Valley. We will have 2 water stations for this course located on Mile 1 and 2. Join us for the after party events beginning right after the race for an all day event with live entertainment until 1pm! Don't forget the Kids Palace activities for all ages! The 5K course will be on the road. We will have 2 water stations for this course located on Mile 1 and 2. Join us for the after party events beginning right after the race for an all day event with live entertainment until 1pm! Don't forget the Kids Palace activities for all ages! You are guaranteed a T-Shirt if registered by May 5th. LIVEFIT with LUPUS Race Event will include a 1-Mile Family Fun Color Run/Walk course designed for all ages on Saturday, May 20th, 2016. Our healthy lifestyle choices are rubbing off on the youngest to the more mature adults! The run/walk will be a great way to be a part of the Race Event experience while also encouraging individual development and a healthy lifestyle. The out and back course will start and end at Pebble Creek Golf Course. Runners will be able to pick up their Race Packets(including t-shirt, Bib Numbers, timing chip and other goodies) , buy fitness apparel, & visit with health vendors. Grilled food available on race day. Because we support our troops, the discount code "MILITARY" is available to any registrant part of the active service. When this page loaded, the official time was 8:12:47 AM EDT.